Sukanya is based on an episode from the Sanskrit epic The Mahabharata. The sage Chyavana has meditated so quietly that ants have built a colony over his body. Many years later the princess Sukanya discovers the ant hill and pokes it with her fan. Chyavana cries out in pain. Recognizing Chyavana’s importance, the king makes amends by offering him Sukanya’s hand in marriage. The Aswini Twins, demigods watching on, are outraged that the beautiful Sukanya should marry the aged Chyavana. They decide to test her: they will restore Chyavana’s youth and make themselves appear as he does, forcing her to choose between the three of them. Will she make the right choice? 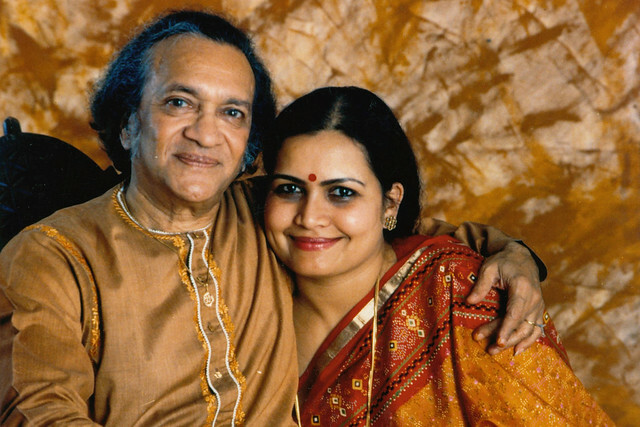 The opera Sukanya is the final work from Ravi Shankar, the great Indian sitarist and a pioneer in bringing Indian music to a global audience. Uniting Indian music with Western idioms was a continuous thread in Shankar’s work – the opera is the next step on from Shankar’s three sitar concertos and his symphony. When Shankar died in December 2012 Sukanya was unfinished; conductor David Murphy, a regular collaborator with Shankar over the final decades of his life, has completed the work for performance. As Murphy explains, ‘Sukanya explores Indian music through the prism of the Western operatic tradition’. ‘Something that integrates music, dance, drama and all aspects of stagecraft’, says Murphy, ‘has been a part of Indian culture for thousands of years’. The variety of artistic disciplines celebrated in Sukanya present something of a logistical challenge, as director Suba Das explains: ‘this staging sees more than a hundred bodies on stage: the full London Philharmonic Orchestra; the BBC Singers; six dancers; six principal performers. It’s kind of a bit like a Rubik’s Cube.’ For Murphy, the wealth of disciplines represents Shankar’s vision of ‘what is now possible in a 21st-century opera: a cross-cultural, total art work for a globalized world’. Joining Murphy and Das are a host of major international artists. Award-winning author Amit Chaudhuri provides the libretto. Choreographer Aakash Odedra has won acclaim for his inspired combination of traditional Indian dance, particularly Kathak, with contemporary dance. On stage with the London Philharmonic Orchestra – whose relationship with Shankar’s music stretches back decades – are the world-famous BBC Singers and leading Indian musicians including M. Balachandar, Pandit Rajkumar Misra, Parimal Sadaphal, Ashwani Shankar and Pirashanna Thevarajah. The singers include numerous Royal Opera regulars, led by Susanna Hurrell in the title role. A huge team makes opera a reality, even beyond the performers and creative team. Sukanya sees numerous producers working together for the first time. As John Fulljames, Associate Director of Opera for The Royal Opera, says, ‘It feels completely appropriate that an artist like Ravi Shankar, for whom collaboration between artists, between musicians and across traditions, in the end should make an opera. Opera is perhaps the most collaborative of all art forms; it involves a real meeting of different artistic disciplines’. This unprecedented collaboration between London Philharmonic Orchestra, The Royal Opera and Curve, Leicester, culminates in four performances across the UK, in Leicester, Salford, Birmingham and London. The production is a co-production with London Philharmonic Orchestra and Curve, Leicester, and is staged with generous philanthropic support from Arts Council England and the Bagri Foundation. I had the pleasure of watching this opera at the Lowry Theatre in Salford. The musicians, singers and dancers were all excellent. It was musical champagne!